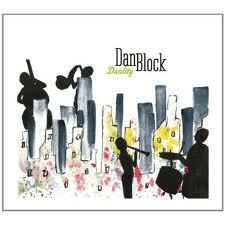 Dan Block’s new CD — a series of duets (and one trio), called DUALITY, is a truly rewarding series of uplifting improvisations — not surprising, considering Dan’s vivid imaginations. Here’s what I wrote about it in September 2012. And Dan has scheduled a live performance to celebrate the CD release and to make more music — on Thursday, January 10, at 8 PM at Zebulon Sound and Light, 223 West 28th St (3nd floor) 212 695 8081. Dan will once again be collaborating with Ted Rosenthall on piano, Chris Haney on bass, Saul Rubin and Paul Meyers on guitar, Tim Horner on drums, and Mark Sherman on vibraphone. Admission is $10. I will still be at the other side of the continent when all this fascinating exploration is taking place . . . so save your quarters, find the other glove, put on your down coat, and make a beeline to Zebulon Sound and Light. It’s what I would do . . . In a world that sometimes seems populated by amiable sleepwalkers, Scott Robinson is vividly alive, his imagination a million-color Crayola box. His music is fully illuminated; it pulsates with energies. I’ve delighted in his playing — in person and on record — for more than a decade now. He has a warm sensibility but is not at all afraid to go out to the edge and make friends with the New, the Sounds Never Heard Before. What he writes and plays is assertive, surprising — but not angry, not pummeling the listener. His new project is just extraordinary, and even an Old School Fellow like me finds it compelling. 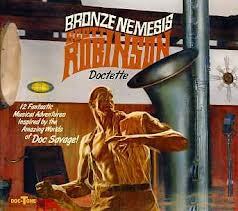 BRONZE NEMESIS is a suite of original compositions devoted to and depicting the immense presence of Doc Savage, hero of pulp novels of the Thirties. (Ruby Braff was a devoted fan, too.) In case all of this is making the more traditionally-minded readers a little nervous, I would point out the players: Randy Sandke, Ted Rosenthal, Pat O’Leary, Dennis Mackrel, and (on one track only) the much-missed Dennis Irwin. The titles of the twelve compositions may suggest to some that Dorothy Gale and Toto are certainly no longer in Kansas — MAN OF BRONZE / THE SECRET IN THE SKY / HE COULD STOP THE WORLD / FORTRESS OF SOLITUDE / MAD EYES / THE METAL MASTER / THE GOLDEN MAN / LAND OF ALWAYS-NIGHT / THE LIVING FIRE / THE MAN WHO SHOOK THE EARTH / WEIRD VALLEY / THE MENTAL WIZARD. The music, ah, the music — I hear echoes of beautifully energized weird film soundtrack scoring on the highest level, a touch of Ellington here, a dash of Gil Evans, a sprinkle of Mingus — but these references are paltry, because Scott’s musical world is his own, where wondrously surprising Latin melodies share space with the theremin and the wind machine . . . the overall effect songful as well as avant-garde, always spacious and searching. I initially felt, “Wow, this is strange . . . isn’t it wonderful?” The CD shows off compositions and inventions from the musicians and the composer that are unusual but not cold; the suite is filled with a warm energy that takes the listener places he didn’t expect to go . . . without scaring him to death. CAUTION: Contains perilous and daring musical adventures. Do not attempt. I’m very glad Scott Robinson exists and has the courage to attempt these adventures . . . so that we can come along on the journey. Here’s a recent email from Scott: if his words (and the video) don’t woo, entice, and entrance, then something’s wrong. Hello, fans of adventurous music! Today, Oct. 12, is the birthday of Lester Dent, creator of the 1930s pulp adventure hero Doc Savage. Therefore this is the day that Doc-Tone Records officially unleashes BRONZE NEMESIS, the new CD of original music inspired by the amazing worlds of Doc Savage, upon the world. Performed by the Scott Robinson Doctette, these 12 compositions evoke the mystery and drama of twelve of the original Doc Savage stories, such as The Secret in the Sky, The Man Who Shook the Earth, and Mad Eyes. Heard in this music are such amazing sounds as a 1954 Moog theremin, slide sax, wind machine, and the mammoth contrabass saxophone. The CD is packaged in a lavish fold-out wallet with extensive notes, startling photographs and original artwork by Dan Fillipone, all protected by a resealable polybag. It is endorsed by original Doc Savage paperback cover artist James Bama, whose striking portrait of Doc graces the front cover. “Loved your music… great jazz. I was most flattered to have a musician of Scott Robinson’s stature compose wonderful jazz for my Doc Savage covers.” -James Bama, original cover artist for Doc Savage paperback editions. Doc Savage is copyright and TM Conde Nast. All rights reserved. Reprinted with permission. Sadly, I won’t be able to be at the October 24 performance — which pains me — because I will be at the Whitley Bay Classic Jazz Party. So . . . mark it down, make plans, get yourself there. I have been fascinated and moved by the CD and am sure that the effects of the music / presentation in person will be even more deliciously powerful. And there’s a resealable polybag too! All our needs satisfied. Posted in Ideal Places, Irreplaceable, Jazz Titans, Jazz Worth Reading, Pay Attention!, The Heroes Among Us, The Real Thing, Wow! 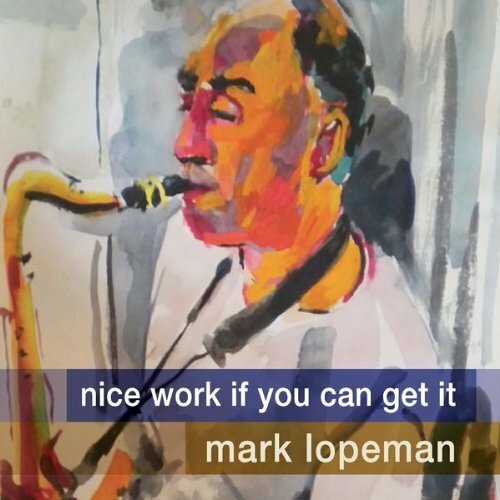 If you’ve been following the New York City jazz scene, you’ll know Mark Lopeman — a master saxophonist who’s been an invaluable addition to many bands for the past few decades. Mark has just released his first CD under his own name, and it’s wonderful. I would offer my own narrow version of the Mark Lopeman saga. When I first began to haunt New York jazz clubs, I heard Mark as a member of Vince Giordano’s Nighthawks, someone who could work his way through the reeds without fear. He swung hard, never missed a turn, and when it came to his feature number — a transcription of the 1939 Hawkins BODY AND SOUL — he played it with accuracy and fervor, but I could hear his personality peeking out through the transcribed notes. Then I had the good fortune to hear him as a guest EarRegular at The Ear Inn with Jon-Erik Kellso and Matt Munisteri. To use the ancient locution, I flipped. He swung, he soared; he was lyrical, witty, and to the point. Ruby Braff had originally wanted to play the tenor saxophone; had he gotten his wish, he would have sounded like Mark Lopeman: wearing his heart on his sleeve but never getting in anyone’s way. Mark is also one of those players who has thoroughly absorbed the tradition but has managed to bob along on the waves, remaining true to himself. So a tenor aficionado will hear affectionate side-glances of Charlie Rouse and Al Cohn, Lucky Thompson and Stan Getz, but Mark is not one of those Real Book / play-along creations who coast from one learned phrase to another. He is himself, and what a good thing that is! Back to our story. When I meet an artist I admire, I am not subtle or restrained in saying so. After the first EarRegulars experience, I think I buttonholed Mark and said, “Wow, you play beautifully! Have you got a CD of your own?” And he looked a bit shy and said he hadn’t. Later on, either at Sofia’s or The Ear Inn, I met his wife, the artist Susan Manley, and said (once again subtly), “Damnit, he plays so well. When the hell is he going to make a CD of his own?” And she agreed with me. I can’t take any credit for helping NICE WORK IF YOU CAN GET IT see the light of day, but I would like to think that my nagging had a point: if there were enough annoying people hanging around the Lopemans making this pesky request, perhaps the CD emerged in some small part to get us to be quiet. Maybe? I worry that JAZZ LIVES readers will think I am always tugging at their collective sleeves (and credit cards) saying “Buy this! Buy this!” But this CD is quietly spectacular. Nice work indeed, Mark — and how lucky we are that we can indeed get it. P.S. The cover portrait is a family affair — a watercolor done with wit and affection by Rosie Lopeman . . . another artist in the house! In this holiday season, it’s always reassuring to be able to hear some jazz that is Rudolph-and-Frosty free. Singer Lynn Stein reminds me that Warren Vache, Houston Person, Ted Rosenthal, Jon Burr, and Alvin Atkinson will be swinging out mightily on Sunday, December 19, from 2 PM on. Rockland Center For the Arts, 27 South Greenbush Road, West Nyack, New York. Telephone 845 358 0877 for reservations, and the website is http://www.rocklandartcenter.org/.